Benjamin Joseph Manaly "e;B. J. "e; Novak (born July 31, 1979) is an American actor, stand-up comedian, screenwriter, and director. He is best known for being a writer and co-executive producer for and playing the role of Ryan Howard on The Office, as well as appearing in Inglourious Basterds. This book is your ultimate resource for B. J. Novak. Here you will find the most up-to-date info… rmation, photos, and much more. 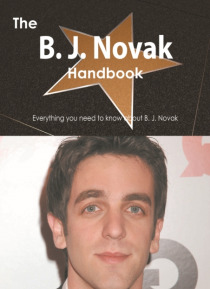 In easy to read chapters, with extensive references and links to get you to know all there is to know about B. J. Novak's Early life, Career and Personal life right away. A quick look inside: Contents, B. J. Novak, 2009 in film, 2011 in film, 2013 in film, Boys and Girls (The Office), Chair Model, Inglourious Basterds, Initiation (The Office), John Krasinski, Local Ad, Premium Blend, Primetime Emmy Award for Outstanding Comedy Series, Rainn Wilson, Ryan Howard (The Office), Safety Training, Screen Actors Guild Award for Outstanding Performance by an Ensemble in a Comedy Series, Sexual Harassment (The Office), The Fire (The Office), The Office (U.S. TV series), Threat Level Midnight, Trivia (The Office), Writers Guild of America Awards 2005, Writers Guild of America Awards 2006, Writers Guild of America Awards 2007, Writers Guild of America Awards 2008, B.J. Novak 180and more pages!Contains selected content from the highest rated entries, typeset, printed and shipped, combining the advantages of up-to-date and in-depth knowledge with the convenience of printed books. A portion of the proceeds of each book will be donated to the Wikimedia Foundation to support their mission.